Antonio Pollaiuolo | Vivat! Crescat! Floreat! Ars longa, vita brevis, iudicium difficile. MANY MEN BEGIN in a humble spirit with unimportant works, who, gaining courage from proficiency, grow also in power and ability, in such a manner that they aspire to greater undertakings and almost reach Heaven with their beautiful thoughts. Raised by fortune, they very often chance upon some liberal Prince, who, finding himself well served by them, is forced to remunerate their labors so richly that their descen- dants derive great benefits and advantages from them. 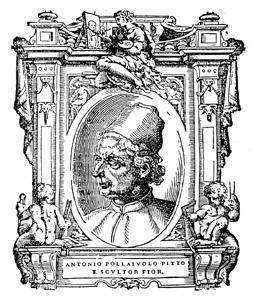 Wherefore such men walk through this life to the end with so much glory, that they leave marvellous memorials of themselves to the world, as did Antonio and Piero del Pollaiuolo, who were greatly esteemed in their day for the rare acquirements that they had made with their industry and labour. These men were born in the city of Florence, one no long time after the other [sic], from a father of humble station and no great wealth, who, recognizing by many signs the good and acute intelligence of his sons, but not having the means to educate them in letters, apprenticed Antonio to the goldsmith’s art under Bartoluccio Ghiberti, a very excellent master in that calling at that time; and Piero he placed under Andrea dal Castagno, who was then the best painter in Florence, to learn painting. Antonio, then, being pushed on by Bartoluccio, not only learnt to set jewels and to fire enamels on silver, but was also held the best master of the tools of that art. Wherefore Lorenzo Ghiberti, who was then working on the doors of S. Giovanni, having observed the manner of Antonio, called him into that work in company with many other young men, and set him to labor on one of the festoons which he then had in hand. On this Antonio made a quail which is still in existence, so beautiful and so perfect that it lacks nothing but the power of flight. Antonio, therefore, had not spent many weeks over this work before he was known as the best, both in design and in patient execution, of all those who were working there, and as more gifted and more diligent than any other. Whereupon, growing ever both in ability and in fame, he left Bartoluccio and Lorenzo, and opened a fine and magnificent goldsmith’s shop for himself in the Mercato Nuovo in that city. And for many years he followed that art, never ceasing to make new designs, and executing in relief wax candles and other things of fancy, which in a short time caused him to be held as he was the first master of his calling. 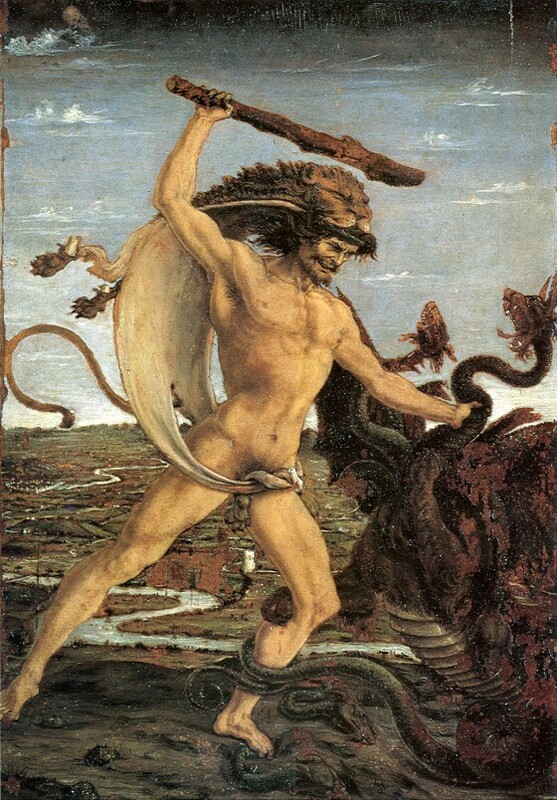 The third picture, wherein Hercules is slaying the Hydra, is something truly marvellous, particularly the serpent, which he made so lively and so natural in coloring that nothing could be made more lifelike. In that beast are seen venom, fire, ferocity, rage, and such vivacity, that he deserves to be celebrated and to be closely imitated in this by all good craftsmen. The first of these, which is slaying Antaeus, is a very beautiful figure, in which the strength of Hercules as he crushes the other is seen most vividly, for the muscles and nerves of that figure are all strained in the struggle to destroy Antaeus. The head of Hercules shows the gnashing of the teeth so well in harmony with the other parts, that even the toes of his feet are raised in the effort. Nor did he take less pains with Antaeus, who, crushed in the arms of Hercules, is seen sinking and losing all his strength, and giving up his breath through his open mouth. Antaeus was the son of Poseidon and Gaia, invincible as long as his feet touched the ground. 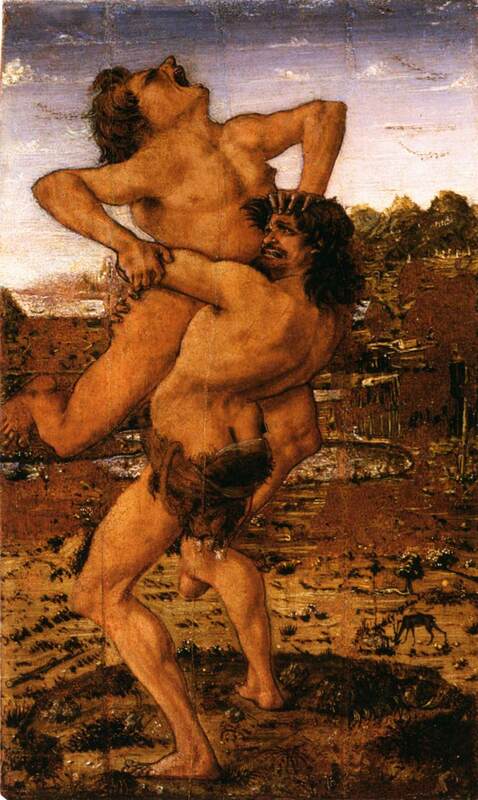 Heracles, on discovering his secret, lifted him up and crushed him in his arms.